Affordable apartments in this locationsubmitted by Li J. - Jan 06, 2019 |Recommended: YesThis is the most cost-effective apartment I can find around the city avenue. Nice and quiet community, green environment, friendly staffs, affordable rent make it a good place to live. If there is something need to improve, such as the night shift staff is not on site often, the hallway could be brighter and cleaner, and it would be great with more community amenities and activities. One of the best apartments i've lived in.submitted by Christopher S. - Aug 03, 2018 |Recommended: YesIt's comfortable here. People in general are friendly, It's clean for the most part. Rent here is affordable and have multiple options for paying. The only problem i have is about food constantly left out for animals. It can get messy and leave a rancid smell all over. There are signs all over saying not to feed animals, but i guess it can't be helped. In general, this is a really good place to live. Peaceful ,safe and well maintained propertysubmitted by Sreya K. - Apr 30, 2017 |Recommended: YesThe property is well maintained, safe and a very good place to live in. Atmosphere has a peaceful aura. The office staff is very friendly and helpful. Overall a great place Glad I found this place and would definitely recommend this place. It's cozy, secluded, spacious, peaceful (most times), affordable, great location!submitted by LaTrina B. 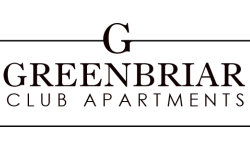 - Jun 13, 2013 |Recommended: YesI've been living here at Greenbriar Club for 3 years. It's a wonderful community to live in. The management staff is friendly, understanding, and extremely welcoming! It's GREAT to know that all of your utilities are included in your monthly rent (you really can't find apartments that offers that nowadays)!! The apartments are large and spacious. The location is perfect, it's nestled back off of the street in which keeps it pretty peaceful for the most part. We have a dry cleaner, Chinese store, Pharmacy, MAC Machine, a Delicatessen that make hot foods and delivers as well. Overall, I really LOVE my apartment and the community! Great!submitted by Brian O. - May 02, 2013 |Recommended: YesQuiet, and secluded from the Major hustle and bustle of the big city. Great Suburban City Settingsubmitted by Kristin D. - Nov 06, 2012 |Recommended: YesMy husband and I just moved out after living at Greenbriar for seven years. We loved the city location with the amenities of suburban convenience. Lots of parking, all utilities included, nice staff, and well located if you love the city and need to be near the burbs. Not to mention the affordable rent! Amazing place to livesubmitted by Regina J. - Nov 05, 2012 |Recommended: Yesit's a great place to live with a wonderful staff that is always quick to help you in any way! A friendly and warm community surrounded by a serene environment.submitted by Deirdre G. - Oct 19, 2012 |Recommended: YesI love living here. Ramon and the entire staff are very responsive and helpful whenever you need them. The apartments are large and laid out very well with more closets than you could ask for. I love our apartment as it faces the quite woods. Everything is kept up to date and if a problem arises it is fixed the same day. Best of all I felt at home the moment I moved in, everyone is very friendly and respectful. All the amenities are at my doorstep. There is always ample parking and you can even rent covered parking. I would recommend anyone to live here, why not?